I value excellence in sound and MARCA reeds deliver that excellence and a unique, wonderfully rich, vibrant tone, full of interest and harmonics – more than any other reed I have tried. Furthermore their price point is very affordable enabling professionals, students and even beginners to have the best reeds available. 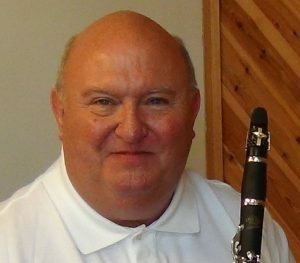 Please note Saxophone reeds, for all saxes, Contra Bass clarinet reeds are available but not advertised here – if you wish to buy Sax or any other single reed other than those listed please contact me – I can offer very competitive discounted prices. I believe in good value for my customers and I applaud MARCA for delivering such high quality cane for a fair price. Sometimes a reed is cut in a way that makes it slightly imbalanced and MARCA along with every other reed manufacturer in the world are not immune to that phenomenon. It would be dishonest to claim every reed in the box is perfect – there is no such reed! For those reeds needing adjustment I use the Ridenour ATG system a great simple device for fixing reeds to perfection sold on this site. Companies advertising computer cut “reeds of perfect dimensions” are trying to convince people they have a superior product because it is cut by computer and measures very precisely. This is irrelevant as a reed can be measured and cut perfectly but still not play well. The reason is: the millions of pores – the cane fibres, are hollow and microscopically small and are sometimes distributed throughout the cane unevenly, causing irregular cane density. The result of this phenomenon is a stuffy unresponsive reed. Clarinettists tend to discard those reeds, but if the cane is good it is often a mistake to discard such a reed when a few simple adjustments can turn the unresponsive reed into a wonderful reed. This is where the knowledge of how to balance reeds is crucial. The secret of acquiring great reeds is to start with good cane – and MARCA produce excellent cane. Few reeds are “perfect” straight from the box as cane is a living breathing substance which changes with climate and some sort of adjustment even to seemingly perfect reeds can enhance them and make them play in a more focussed way. 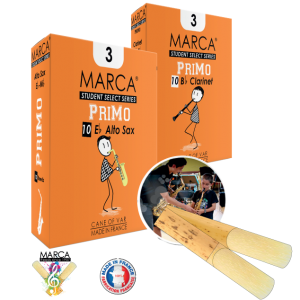 I urge you to try MARCA as they have a wide range of products from the Primo developed as a beginner reed with a very modest price tag that delivers and delivers a clear and warm sound and is incredibly good value for money. They along with the other products in the range happen to be a perfect match for the Ridenour Pro mouthpiece and they sound great in combination. 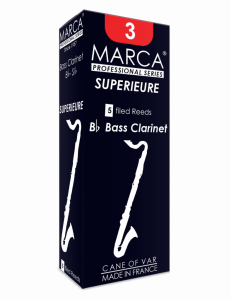 I supply a selection MARCA reeds free of charge when I sell a clarinet – I have confidence that they will deliver a great result for my customers who buy Ridenour clarinets and am honoured that MARCA FRANCE have agreed to allow me to sell their product here. The flagship of the brand is the Superieure, a long blade-length thick heeled reed with a considerable harmonic content (more than any reed I have tried) to carry the sound into the hall. 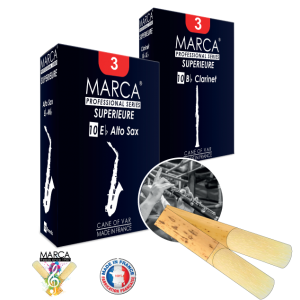 I have used these for most of my career in conjunction with Premium – another reed made by MARCA. The Premium is shorter in the blade with a thick heel and produces a satisfyingly full bodied, round sound. Please note: free shipping is for UK customers only – customers from other countries should contact Leslie direct via the contact page and place their order via email. PLEASE NOTE -January 2019 I am currently out of stock for 2.5 MARCA SUPERIEURE but am happy to supply any other strength listed – 3 or 3.5 until I can re-stock. Alternatively I do have 2.5 in Primo the least expensive reed but very consistently good. Right – Primo – designed for less experienced players, shorter blade thinner, vibrant reed, works well even in professional concerts well matched to the Ridenour pro mouthpiece. Left – Premium – shorter blade thick heel – a compact full bodied sound ideal for less resonant acoustics but equally good in the big hall.